Produktmerkmale This ELISA kit is based on a sandwich enzyme immunoassay. The wells of the plate are coated with a highly purified antibody against mouse/rat CRF, calibrators or samples are added for the 1 st step immunoreaction. After the 1 st step incubation and plate washing, labeled antibody solution (biotinylated rabbit anti-mouse/rat CRF antibody) is added as the 2 nd step to form antibody-antigen-labeled antibody complex on the surface of the wells. After the 2 nd step incubation and rinsing of excess labeled antibody, horseradish peroxidase (HRP)-labeled streptoavidin (SA) is added for binding to the labeled antibody. 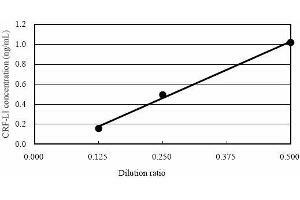 Finally, HRP enzyme activity is determined by 3,3',5,5'-tetramethylbenzidine (TMB) and the concentration of mouse/rat CRF is calculated. 9. Plate Seal: 4 sheets. Hintergrund Corticotropin-Releasing Factor (CRF, or CRH) was initially isolated from ovine hypothalamus by Vale et al. (in 1981), and was identified as a novel neuropeptide comprising of 41 amino acid residues with a molecular weight of 4,758 Da. Later human CRF and rat CRF were also isolated and identified. 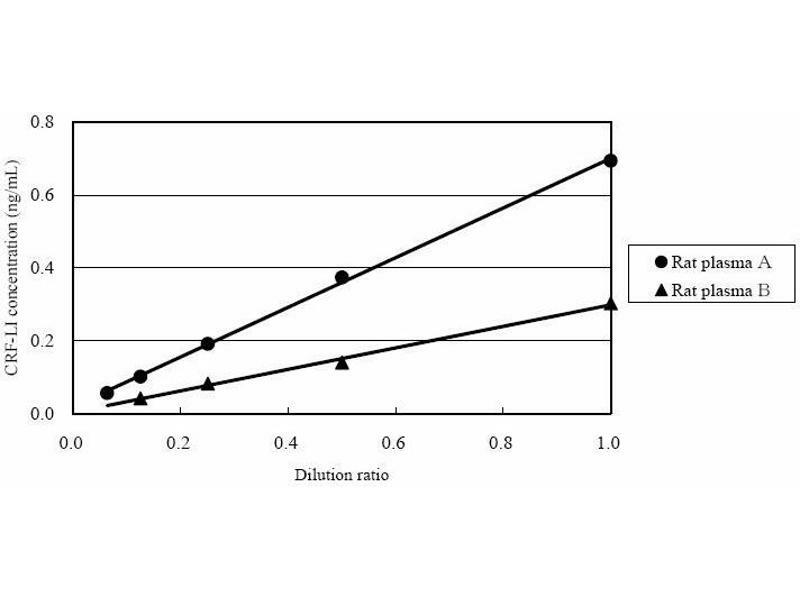 The mouse CRF peptide is identical to the rat and human CRF peptides at the amino acid level. CRF in the anterior pituitary promotes the synthesis and secretion of ACTH, a main factor of hypothalamus-pituitary-adrenal (HPA) axis. In rats and humans, CRF distributes mainly in the hypothalamus, but it was also found in the spinal cord, stomach, spleen, duodenum, adrenal and placenta. In addition, immunochemical evidence supported the wide distribution of the peptide throughout the central nervous system (CNS) such as olfactory bulb, retina and central auditory system in the rat. In mouse brain extracts, the highest concentration of CRF-like immuno- reactivity (CRF-L1) has been detected in the median eminence, hypothalamus, amygdala, thalamus, frontal cortex, medulla/pons and cerebellum by radioimmunoassay. However because of the wide distribution, it is still in dispute whether CRF blood level can reflect the function of HPA axis. The relationship between CRF and stress, and CRF and Alzheimer disease (AD) has attracted much attention. In fact, the peptide was also suggested to regulate endocrine, autonomic and behavioral responses to stress, based on an experiment with acute and chronic stress rat models that showed endocrine function changes similar to those seen in patients with depression. 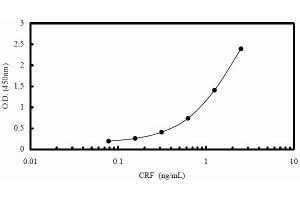 CRF in serial cerebrospinal fluid (CSF) of patients with depression was strikingly reduced as compared to those of normal subjects. The mean CRF and ACTH levels in the CSF of AD patients were significantly lower than those of healthy controls. Only in the cortices of those with mild dementia, CRF was reduced significantly, thus CRF was proposed to serve as a potential neurochemical marker of early dementia and possible early AD. A large proportion of the CRF in human brain was shown to be in the form of a complex with its binding protein (CRF-BP). The CRF molecule in the complex is unavailable for activation of the CRF receptor. Accordingly, reductions in total CRF do not necessarily predict reductions of bioactive free CRF, and the levels of total CRF and CRF in the form of complex (CRF/CRF-BP) were suggested to be the main factors determining the quantity of bioactive free CRF in human brain. In AD there have been observed dramatic reductions in the content of free CRF in the brain and thus displacement of CRF from CRF-BP was proposed as a possible treatment for AD. In primary neuron culture, CRF exhibited protective effect against cell death induced by amyloid-beta peptide, suggesting that disturbances in HPA axis function can occur independently of alteration in CRF mRNA levels in AD brain and further suggesting an additional role for CRF in protecting neurons against cell death. 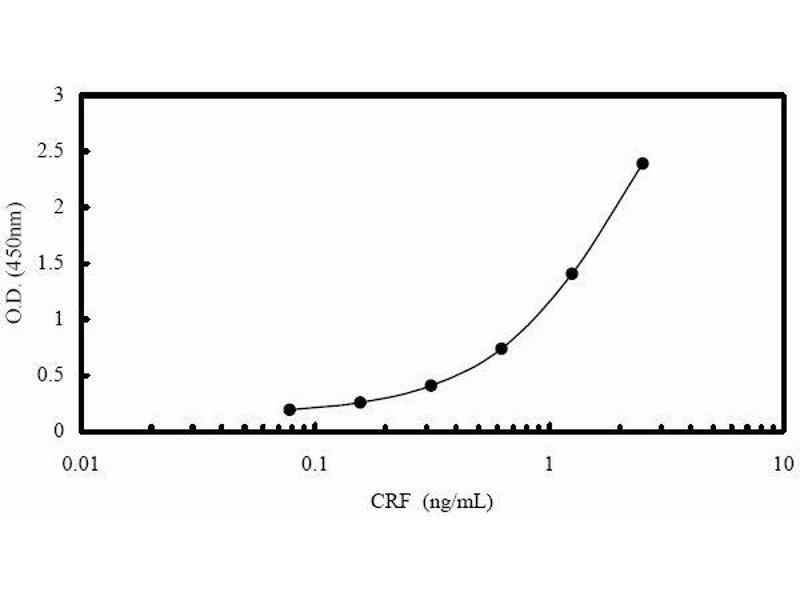 On the other hand, Yanaihara et al., demonstrated immunoreactive CRF in various neuroendocrine tumors, and suggested that the blood level of the peptide might be used as a tumor marker. This information shows the importance for the measurement of CRF in the brain, particularly in experimental animals, not only for analysis of the function of CRF in CNS, but also for research in the fields of stress response and AD. The advantages of this assay include high specificity, sensitive quantification, and no interference from other components in samples. Mouse/Rat CRF Calibrator is highly purified synthetic product. Additional pretreatment of the brain tissue extract before assay is not necessary. 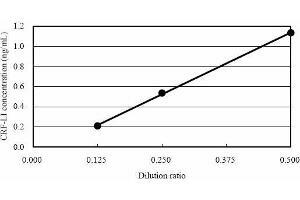 Preparation of Calibrator Solution: Reconstitute the CRF Calibrator with 1 mL of buffer solution, which makes a 2.5 ng/mL Calibrator Solution. 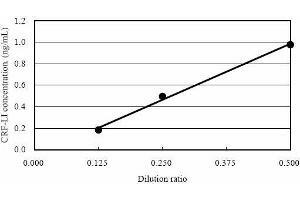 Add 0.2 mL of the reconstituted Calibrator Solution with 0.2 mL of Buffer Solution, which yields a 1.25 ng/mL Calibrator Solution. 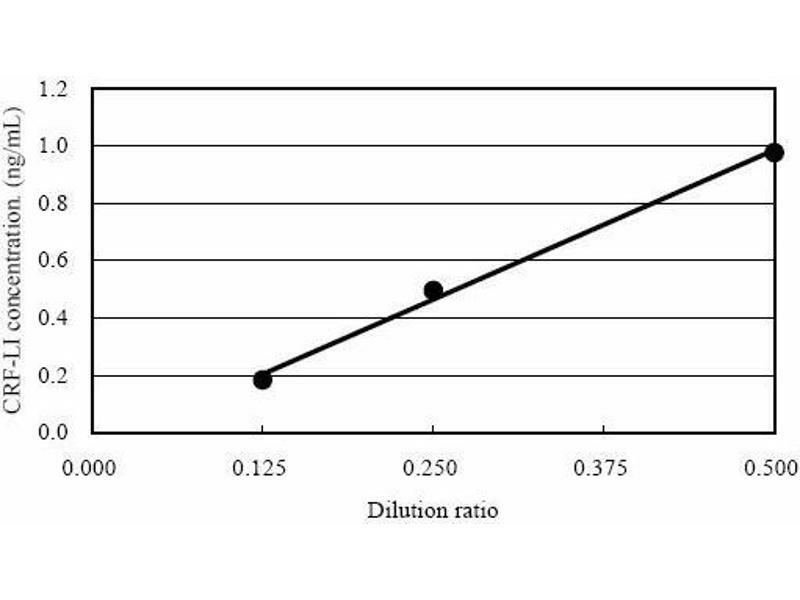 Repeat the serial dilution procedure to make 0.625, 0.313, 0.156 and 0.078 ng/mL Calibrator Solutions. 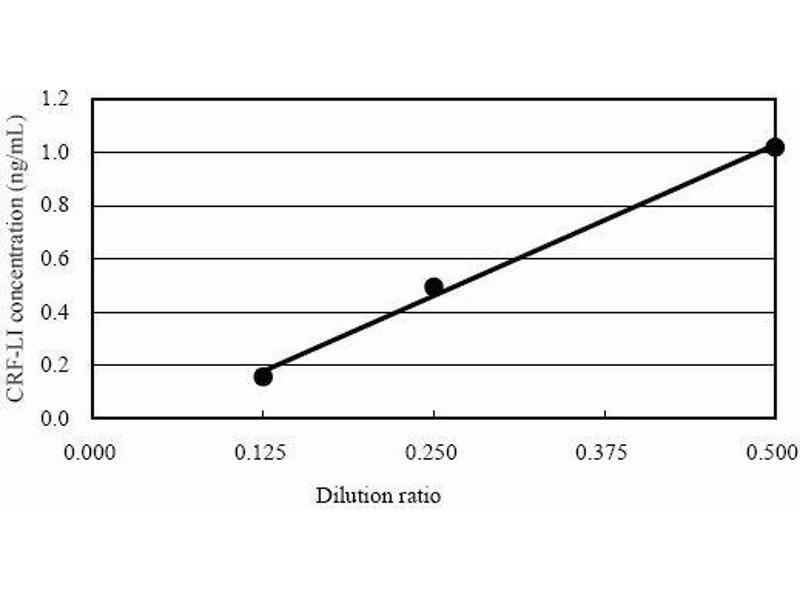 Buffer Solution is used as the 0 ng/mL Calibrator. 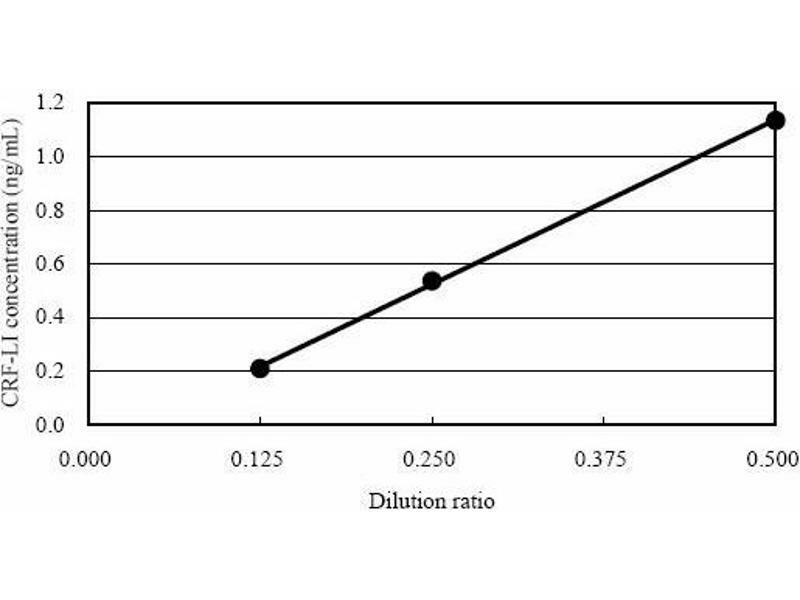 If a sample concentration below 0.078 ng/mL is predicted, the calibration curve may be further set up with a lower detection limit by using a 0.039 ng/mL calibrator solution which can be prepared by a 2-fold dilution of the 0.078 ng/mL calibrator solution. 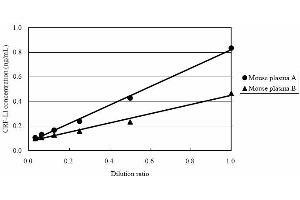 In such case, however, assay precision may not be so excellent as that of the cases between 0.078 and 2.5 ng/mL. 2. 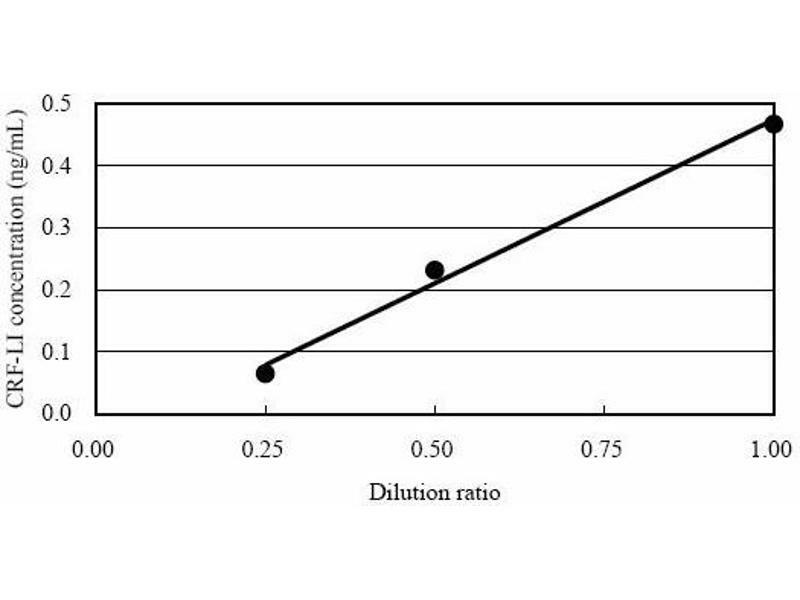 Preparation of Wash Solution: Dilute 50 mL of Wash Solution Concentrate to 1,000 mL with distilled or de-ionized water. 3. The other reagents are ready for use. Bring all the reagents and samples to room temperature (20-30°C) before starting assay. 2. 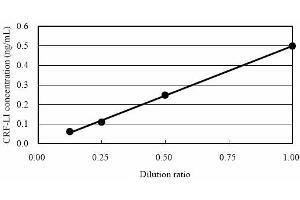 Add 0.35 mL/well of diluted Wash Solution into the wells of the plate, and then aspirate the solution. Repeat this washing procedure twice (total 3 times). Finally, invert the plate and tap onto an absorbent surface, such as paper toweling, to ensure removal of most of the residual Wash Solution. 3. 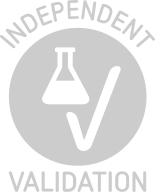 Add 50 µL of Buffer Solution, and then add 50 µL of each prepared Calibrator Solution (0, 0.078, 0.156, 0.313, 0.625, 1.25 and 2.5 ng/mL) or samples into wells. 4. Cover the plate with a Plate Seal and incubate at room temperature for 4 hours. During incubation, the plate should be shaken with a plate shaker (approximately 100 rpm). 5. 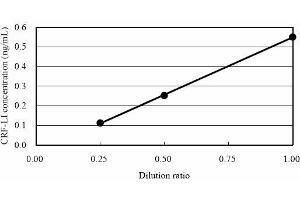 After incubation, remove the Plate Seal, aspirate the solution in the wells and wash the wells 4 times with approximately 0.35 mL/well of diluted Wash Solution. Finally, invert the plate and tap onto an absorbent surface, such as paper toweling, to ensure removal of most of the residual Wash Solution. 6. Pipette 100 µL of Labeled Antibody Solution into each of the wells. 7. Cover the plate with a Plate Seal and incubate at room temperature for 2 hours. During incubation, the plate should be shaken with a plate shaker (approximately 100 rpm). 8. Remove the Plate Seal, aspirate the solution in the wells and then wash the wells 4 times with approximately 0.35 mL/well of diluted Wash Solution. Finally, invert the plate and tap it onto an absorbent surface, such as paper toweling, to ensure removal of most of the residual Wash Solution. 9. Pipette 100 µL of SA-HRP Solution into each of the wells. 10. Cover the plate with a Plate Seal and incubate at room temperature for 1 hour. During incubation, the plate should be shaken with a plate shaker (approximately 100 rpm). 11. Remove the Plate Seal and aspirate the solution in the wells and then wash the wells 4 times with approximately 0.35 mL/well of diluted Washing Solution. Finally, invert the plate and tap it onto an absorbent surface, such as paper toweling, to ensure removal of most of the residual Washing Solution. 12. Add 100 µL of TMB solution into each of the wells, cover the plate with a Plate Seal and incubate for 30 minutes at room temperature, protected from light (keep still, plate shaker not needed). 13. 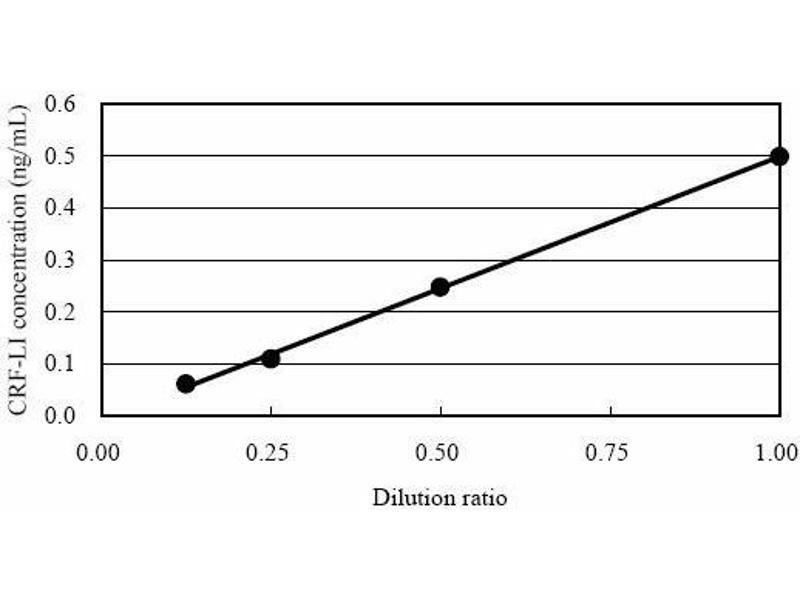 Add 100 µL of Stop Solution into each of the wells. 14. 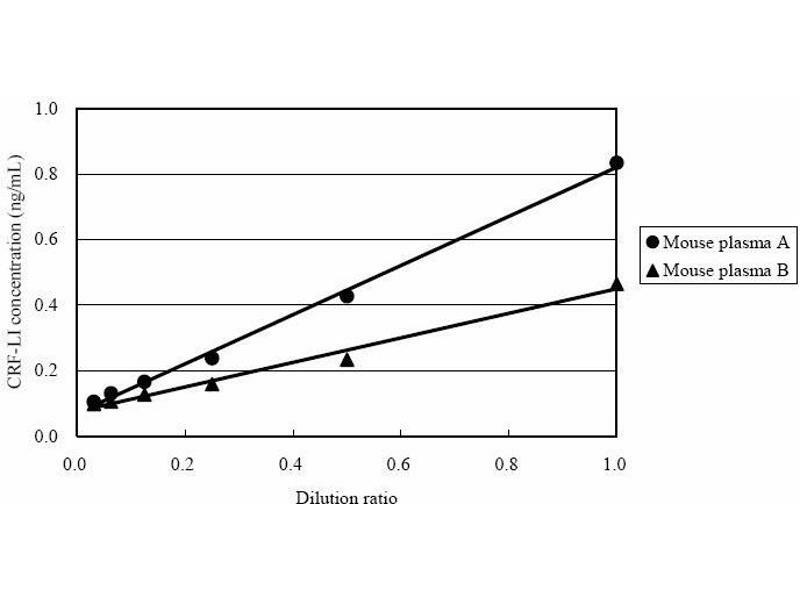 Read optical absorbance of the solution in the wells at 450 nm. 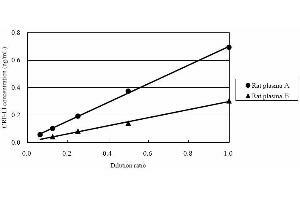 The dose-response curve of this assay fits best to a 4 (or 5)-parameter logistic equation. The results of unknown samples can be calculated with any computer program having a 4 (or 5)-parameter logistic function. 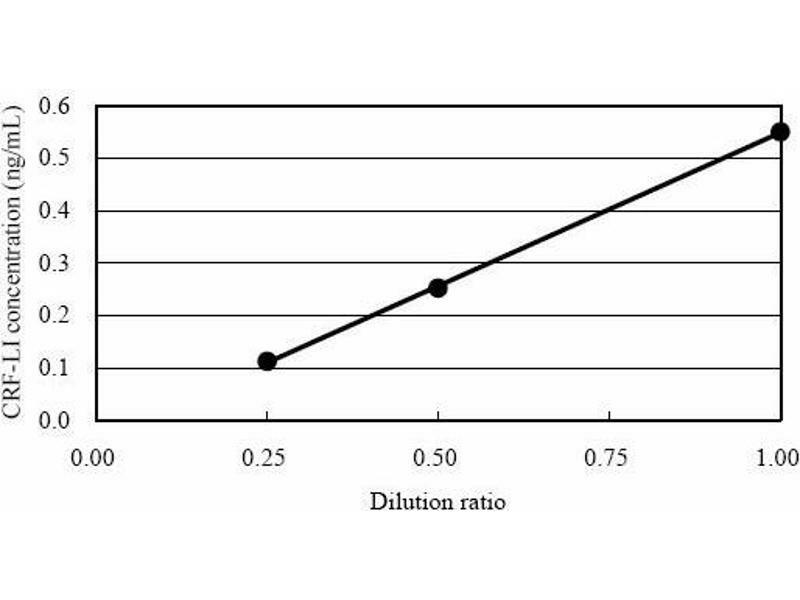 Otherwise calculate mean absorbance values of wells containing calibrators and plot a calibration curve on semi-logarithmic graph paper (abscissa: concentration of calibrator, ordinate: absorbance values). 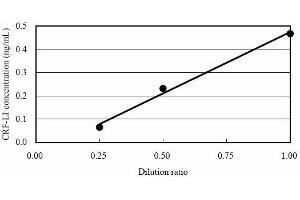 Use the average absorbance of each sample to determine the corresponding value by simple interpolation from the calibration curve.